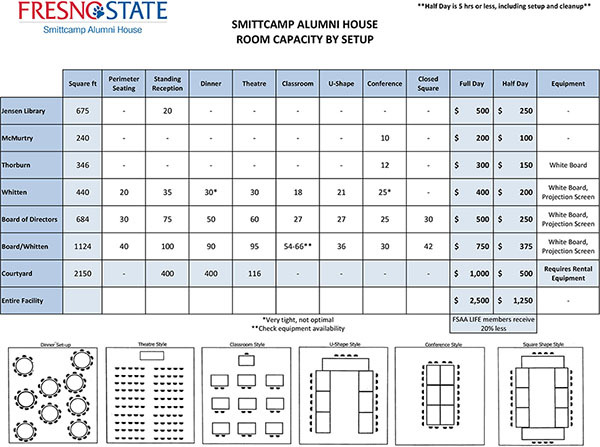 To encourage FSAA Chapters to use the Smittcamp Alumni House for chapter meetings and events, room rental charges for chapter events are absorbed by the Alumni House. Weekend surcharges, set-up/clean-up and staffing charges still apply. • Please support your Alumni House! Personal and commercial events are welcome and classified as “off-campus” events. Revenues help pay for house maintenance and marketing costs. • FSAA Life members are eligible for member rates (20% less than the full rental rate). • Chapters reserving on behalf of other organizations are classified as “off-campus” events. • Full balance of charges is due one-week in advance. Credit cards and checks payable to “Fresno State” will be accepted. • Allow a minimum of 3 weeks to schedule small meetings and 2-3 months for larger functions. 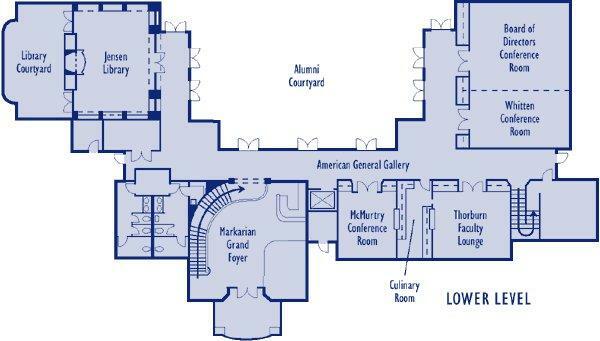 • Use the “Room Capacity by Setup” to select a room that will accommodate your event. • Authorized Chapter Officers must review, sign and return the confirmation to secure the reservation. Reservations without a signed confirmation are subject to cancellation. • NORMAL EVENT HOURS: Monday-Friday between 8:00am and 5:00pm. Normal event hours during summer are between 7:30am to 3:30pm. • Staffing charges apply outside of normal event hours (weekends and evenings). All catering and food service MUST be arranged through University Food Services. The catering department will bill you separately. • Contact Megan Sarantos, Catering Manager at (559) 278-4345. • Table linens are provided by request from University Food Services. The Alumni House does not have a linen service. o Additional Insurance Requirements will apply. • Tables and chairs for indoor events are provided (call to confirm equipment is available). • Courtyard events require equipment rental (tables, chairs, etc.) from an off-campus vendor. Chapters are responsible to make these arrangements. • Rental drop-off and pick-up times must be approved by the Reservation Office prior to event. • Most rooms are equipped with projection screens and/or small white boards. • Chapters are responsible to supply their own laptop or A/V equipment. • Final headcount and room set-up (or rental delivery) is required 2 weeks in advance. Once the event work order has been submitted to Plant Operations, no further changes can be made. Once the work order is submitted to Plant Operations alterations will be charged at $25 each. • Chapters MUST request parking codes passes at least 10 days in advance. • Please contact your department contact (e.g. Craig School, Kremen, etc.) or the Alumni House Reservation Office to obtain parking code passes for your guests. • Chapters are responsible to distribute codes to guests/attendees. • Available through the campus Bulldogs network. • If you do not have a csufresno.edu login, make arrangements for guest logins with your department (e.g. Craig School, Kremen, etc.) or with the Alumni House Reservations Office. • Chapters MUST request at least 1 week in advance. • No charge to cancel events more than 2 weeks in advance. • Cancellations within 2 weeks of an event will be charged 25% of the off-campus rental rate. * Do you have a room preference? * Will you be setting up a tent? * Will food be served at the event? A Food waiver may be requested at least 30 days prior to the event. Please contact Food Service for details. A copy of the waiver request and documentation of approval must be on file with the Alumni House 5 days prior to the event. There will be a minimum charge of $25 for all events with approved food waivers to cover additional clean up and trash removal services normally provided by University Catering. * Will you be requesting a Food Waiver? * Will alcoholic beverages be served at the event? Alcoholic beverages may be served by pre-approved permit basis ONLY. Additional insurance, staffing and costs may apply. A copy of the request and documentation of approval must be on file with the Alumni House 5 days prior to the event. NO KEGS. NO HARD ALCOHOL. * Will you need any of the following equipment? * Will you need any additional services?